Nearly 1,000 fans participated in the first-ever Rock the Resch event, Friday, Feb. 25, 2017, at the The Bar on Holmgren Way and the Resch Center. 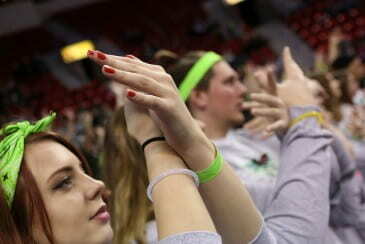 The “homecoming-type” tailgate sponsored by the UW-Green Bay Alumni Association preceded a fan March to the Resch and a Phoenix men’s basketball game. Didn’t make it? The video and photo gallery will give you a taste of what you missed and why you will want to register next year. Click to view the album on Flickr. This entry was posted in Event Photos, Events and tagged Green Bay Basketball, Rock the Resch, Student/Alumni Gatherings on March 22, 2017 by moodyk.